For my semester activity I have chosen to advertise this course to more freshmen. Being the only first year student in this course was intimidating at first, but the knowledge I gained was impeccable! Now that I know of all these resources available at the university, I have a much greater appreciation for digital making. 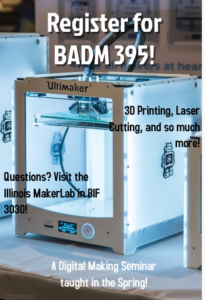 In addition to the slide being displayed, I have also made a flyer that could be posted around BIF and the engineering quad around the same time as registration. The flyer below is a draft from postermywall.com, however we could place a large order next spring to begin placing them around BIF and Wohlers. I understand that this course was promoted through College of Business emails, however it was my dad who is on UIUC Course Explorer every day, who first told me about this course. 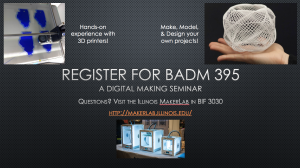 If more people knew about it and hopefully more applications be sent in, the MakerLab would continue to grow and maybe even another section of the seminar could be created! Again, the amount of resources I have gained through this course is amazing and all freshmen in the College of Business should know about the awesome things happening in BIF 3030. I am excited to see the increase in volume for next year and reach out to my former professors to see their responses! This entry was posted in Reflections by John O'Gara. Bookmark the permalink. These are awesome Jonny! Only thing I would recommend is that you add the “DMS” section to the “BADM 395” part (just because there’s loads of different BADM 395 sections). Thanks so much for spreading awareness about this awesome class!